The Microsoft Exchange has an additional feature in its 2016, 2013, and 2010 versions which helps to detect clients which are consuming excessive resources of the mailbox. MAPI clients use multiple threads when it is connected to a mailbox. Although, if one or more threads freeze due to some reason then it consumes more CPU than it should for servicing the thread. If more than five threads freezes for more than 60 seconds or three threads gets crashed in the duration of 2 hours then also it is considered as MailBox is not in a normal state. If this condition occurs then you might need to Repair Quarantine Mailbox Exchange 2016 by implementing PowerShell Cmdlet Disable-MailboxQuarantine. To check the number of crashes which happened in the mailbox, quarantine is performed by the background thread in every two hours. If the Exchange mailbox surpasses the maximum number of crash threshold, then the mailbox is put into quarantine by the Server itself for the overall stability. This feature is enabled by default by the Exchange Server when the thread crashes. Thus, when the mailbox is in quarantine state, it becomes inaccessible for the users. A message is displayed showing that your message wasn’t delivered because the recipient’s mailbox is quarantined. Now, to remove Quarantine mailbox in Exchange, users have to repair the issue. So, in this article, we have discussed the methods to fix the error. There occur some instances when users are not able to access MS Exchange Server mailbox and is declared as poisoned Exchange mailbox. Therefore, in the below section, we are going to discuss several types of events due to which a potential threat is caused to the Exchange mailbox. If more than 5 threads of a particular mailbox stop working simultaneously for more than 60 seconds, then it is not considered as a normal state. If a thread which is working for a particular mailbox fails, then it takes mailbox in an abnormal state. The above-mentioned causes are responsible behind the poison Exchange mailbox. If any mailbox is experiencing any of these two threats then it quarantines the database of MailBox. It will identify the number of failures that caused the abnormal state of the mailbox. It is 3 by default. It will define the amount of time a mailbox remains in the quarantine state. By default, the value is 6. Now, if the IsQuarantined is true, then it is a condition of poisoned Exchange mailbox. Corruption Type – It specifies the type of corruption that a user wants to detect and resolve. Mailbox – Specify the mailbox on which the command is to be implemented. Database – Specify the database on which the command is to be implemented. Archive – This command detects the corruption and fixes the archive mailbox of the specified mailbox. DetectOnly – Specify that user wants to detect the errors but not to fix them. StoreMailbox – It specifies the mailbox GUID that a user wants to resolve. The default time for Exchange mailbox quarantine is six hours. Once, the process to fix the issue is completed, users can disable the mailbox quarantine. Run the below-mentioned cmdlet to disable poison mailbox Exchange 2013 or 2010. This command will remove the mailbox of Peter Baris from quarantine. The major limitation of fixing Exchange mailbox using PowerShell is that the cmdlets are not available in Exchange 2010. However, these commands are hard to understand and time-consuming too. If any mistake happens during the implementation of these commands then users have to execute the commands from where they started. Therefore, users can also remove quarantine from Exchange mailbox 2010, 2013 or 2016 using some third party application. This application can recover Exchange mailbox easily and quickly. Another benefit of using this software is that users don’t have to be technically sound to execute these commands. 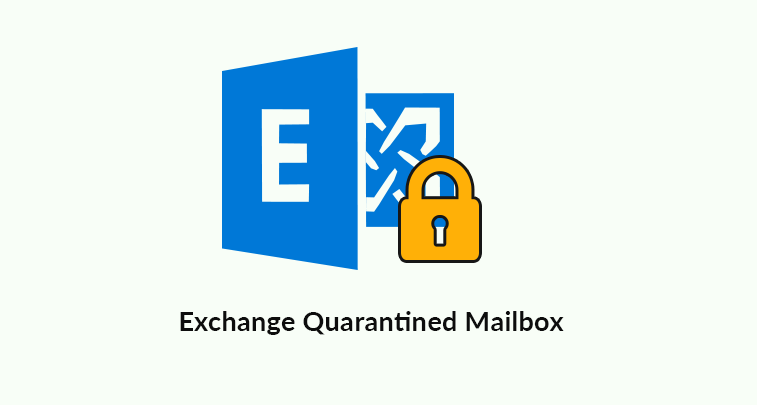 Whenever there occurs corruption in a mailbox or it goes into abnormal state then by default the Exchange Server will be quarantined for six hours. It becomes inaccessible and users can’t operate the mailbox. Therefore, to overcome all these issues, users can repair Quarantine mailbox in Exchange 2013, 2010 or 2016 versions using PowerShell Disable-MailboxQuarantine commands and using cmdlet. Although, the cmdlet command will only fix Exchange 2013 mailbox, but not Exchange 2010. So, to remove quarantine issue in every version of Exchange mailboxes in an efficient and effortless way that too without any limitation. Users can go for a third party Software i.e. Exchange MailBox Recovery Tool.